This property is a 12-minute walk from the beach. 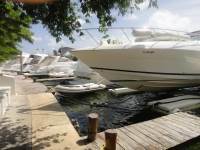 Directly on Nichupte Lagoon, across from the street from the Caribbean Sea, in Cancun's hotel zone, this hotel offers a private yacht club, tropical gardens and an on-site restaurant. 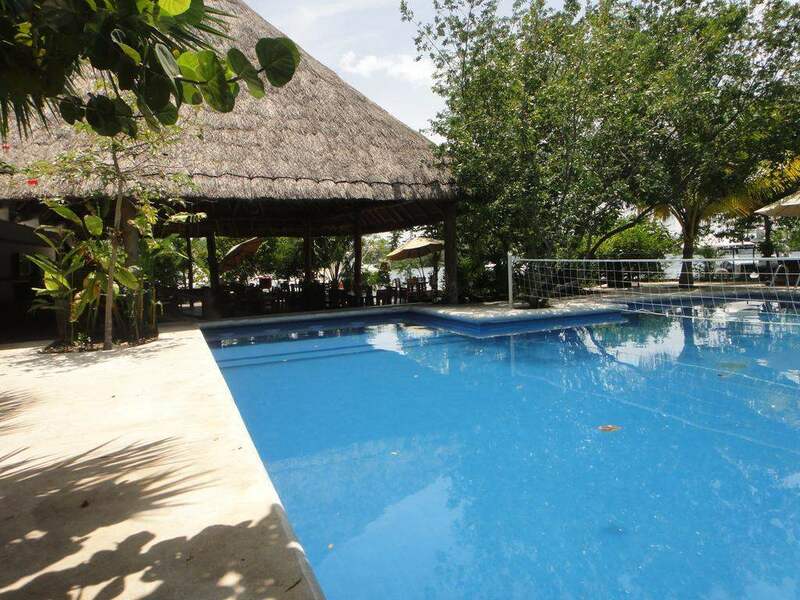 Sotavento Hotel & Yacht Club features relaxing facilities such as an outdoor swimming pool. 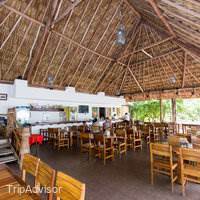 Guests will also enjoy the hotel's La Palapa Restaurant, which services regional and international dishes for breakfast, lunch and dinner. 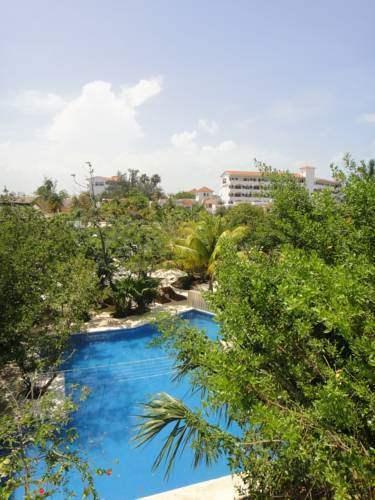 Cancun city centre is only minutes from the Sotavento Hotel. 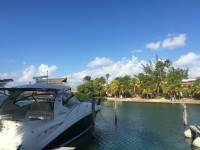 Guests can spend the day at the nearby beach snorkelling or soaking up the sun, then explore a variety of area restaurants and bars in the evening. 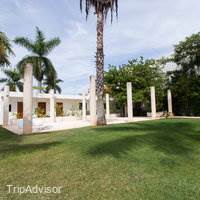 The property is located just 650 feet from Cancun Theater and 1,000 feet from Isla Mujeres ferry. I had stayed at this location some time ago for a few nights, was not impressed then but decided to give it another chance to keep in order to keep my expnses down. Hotel off main road and you probably wouldn’t Find it without directions. Upon arrival staff was courteous and showed me to my room. I had requested a first floor room due to hip surgery. The room was not too far away from entrance but required climbing several steps then descending down another 8 or so to the room. The room appeared to be clean, albeit Spartan. Two beds with mattresses on the low end of the spectrum. No closed closets or bureaus. 1 chair with a small desk and small tv. TV had at best three nondescript tv channels in English. One news, One sports(football), and a channel that I was not familiar with. 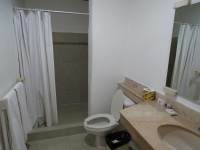 No amenities in room ie: coffeemaker, microwave, small fridge, iron, etc. two small bottles of water provided ((you would not want to drink the tap). 1 hand towel in bath and no bath towels or wash clothes. Lighting in room was minimal although A/C (in wall) was adequate. Had to speak to housekeeping for towels. Shower drain gurgled continuously and warm, (not hot) water was just so, so. The restaurant on premises was reasonable and food ( what I had) was good. Service for lunch/ dinner wa courteous, helpful and prompt with ameniable staff. He pool area was reasonably kept except for some vegetation and I did not see it appear to be running filtration while there. Wi-fi available only by front desk area and in restaurant. An area by the front desk was set up sort of like a small lounge area, with open walls, wooden benches and acoustically loud due to other guests .No real amenities nearby with a small Mexican restaurant (open air), a small “market” and an OXXO convenience store nearby within several blocks. You must travel to find regular dining or a Real supermarket.this location would probably be OK for someon looking to save money ( rates are very reasonable on line with a little searching) and only planning to use it for a place to stay while exploring the rest of the area.Note: I did have an issue with what appears to be some other guest having loud conversations, laughing and making noise outside my room area at 6:30am for about a half hour. By the way, just went back to my newly cleaned room. And NO TOWELS!, again......but on the brighter side, the room appeared clean . Now, to top it off, went for lunch, ordered a “Hambureger with fries! Ended up with a cheeseburger with ham and cheese! Even after having pointed it out on the menus and the waitress explains to the waiter? Just not my day I guess. Me and my partner stayed here for 10 nights at the start of September! The rooms were clean and staff were friendly ! It was a good base if you like going out during the day , the restaurant food was nice and very affordable. The only negatives that we have was there was no towels when we arrived and on most days we didn't get any towels and on the days we did get towels it was only one small hand towel. The aircon is also very loud so was difficult to sleep with it on. 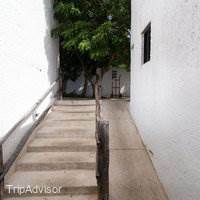 Otherwise we had no other issues, we enjoyed the location as was close to the bus routes to go further down the hotel zone or into downtown. 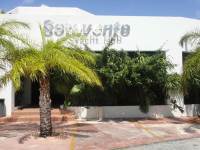 I did some research and decided on this place, The Sotavento Hotel. 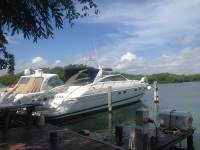 Also have a yacht club a swimming pool and scuba dive in with lessons and specialized scuba photos. 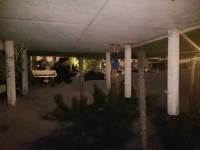 The place is clean and there are always people cleaning, pruning trees, helping you all the time. The AC is excellent and under your control. It is quiet at night (I was here 8 nights) so I saw a lot. They seem to have everything under control, a safe in the room, black out shades when you need to sleep late.Outside my room on the third floor is a little patio which has a nice view of the water.I forgot, they also have a good restaurant open early and late.Quiet, safe, in a great location on hotel row in Cancun, a 24 hour store next door, a Starbucks in a 5 minute walk with the usual only 1/2 price :) Also great fast wifi if you need it.Hotel also has wifi at the restaurant and pool areas and the lobby but not so much in the rooms. I thought this would be difficult for me but I went to Starbucks everyday to get work done. Very nice. Very cold in Starbucks!!! Money gets stolen here by the cleaners. Please be aware and lock everything away. £80 got stolen and the worst thing was when I told the manager he defended his staff shrugged his shoulders and just smiled at me. This in itself was insulting. Manager stated that cleansers took pictures of my purse and envelope with money in it so they didn't take it. Claiming that I didn't put my money in a safe place. Clearly the staff had gone into my suitecase and unzipped my purse pocket and saw the money and took it and then took a picture. As you can imagine I was fuming at this and it all felt like a plot. Not all of the money was gone but few 20 notes as they thought this would go unnoticed. Please be aware of this and take care of your belongings. The staff are very unhelpful and just laughed when I expressed my worry. Also very stingy on towels and when asked for them they the staff were unpleasant about it. The Sotavento Hotel was where we stayed for our first night in Mexico. Location was great. Hotel was beautiful with the white stone. Very rustic and exclusive. Staff was extremely friendly and helpful. Jonny at the front desk is always smiling! Rooms are good size with AC. I did have tape with me for the rest of the trip for decorations. I had used the tape to tape around the AC unit because mosquitos were coming in if not and we would have been bit alive!. The pool and sunset on the waterway was unreal. Food was good and drinks were cheap! Def would of liked staying here the entire trip! We ended up staying here as there was no availability elsewhere for the budget. Location is great. 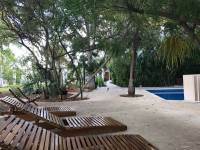 Walking distance to the ferry that will take you to Isla Mujeres. This stop also has ground transportation if you're thinking about going to Cozumel. There are convenience stores and a big mexican restaurant within walking distance. The room was quaint. AC worked very well. TV channel reception was OK. I like to watch the news on the local channels but the volume was almost inaudible. The vegetation is pretty. The cleaning staff are super friendly and efficient. The pool could use more TLC. Water is foggy. I can't think what the solution could be against mosquitos, except wear repellent. If you're thinking of winding down by the pool at the end of the day, the mosquitos will. Have a feast on you. The staff by the reception could also be friendlier. In general, this is a clean place to stay. 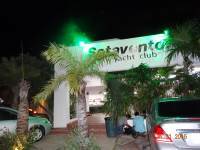 The Hotel Sotavento & Yacht Club is a decent but very basic hotel. 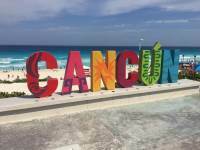 My daughter and I just recently spent 10 days in Mexico. 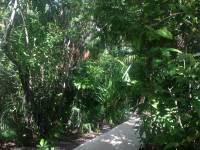 We were actually staying on Isla Mujeres but wanted to do a tour of Tulum and see Cancun so spent a few days in the middle of our trip at the Hotel Sotavento while also keeping our room on the island. It ended up to be the perfect spot for what we wanted. The Pros:• The price was extremely cheap and it was a good place to just crash and hold a few of our things while we went off for our tour.• It is on a side street right across the street a from the closest ferry dock to downtown Cancun that is located in the hotel zone so we were able to get there easily from the island. • There is a small convenience shop right next door and a Starbucks a couple blocks down the road.• The busses stop right on the main drag up the street from the hotel.• Check in was easy and the guys at the front desk were very laid back, friendly and fun.• Our room was surprisingly beautiful with the biggest bathroom I have ever had in a hotel before. Not the most luxurious but huge with lots of counter space and shelves. Great for females and all the junk we have to bring.• It was very, very clean. In fact when we arrived it had just been recently cleaned and you could still smell the bleach that was used in the bathroom and on the floors. 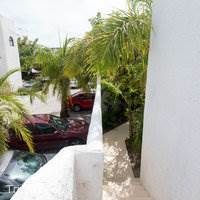 • We had a cool patio that was surrounded by beautiful vegetation that kept it private from the other roomsThe Cons:• There are no room amenities such as a blow dryer or iron but you can bring your own. Little steamers are cheap and easy to pack and work great.• No mini fridge but you can find Styrofoam coolers and get ice from the pool bar. • They use keys at the hotel, not cards. They give you one key for your room and one for your air conditioner. They are both connected which forces you to turn off your air when you leave the room and keeps costs down for the hotel. Our room stayed pretty cool naturally and it wasn’t a big deal to cool down whenever we would return. • They do have safes in the rooms but you need to get a lock for it from the front office. I think there is a charge. 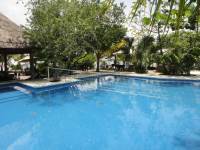 We didn’t need it.• They have a fun little pool but if you want a beach there is a short walk to get to a nice one.• If you need your morning coffee you will have to pay for their continental breakfast or walk to Starbucks. There is no coffee maker in the room.All in all, I have to say that I was very pleased. It suited our needs perfectly. 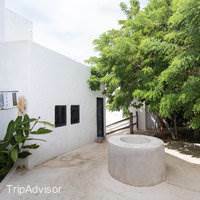 I could see this being a good place for people on a tight budget who want to visit Cancun and who don’t need to be pampered. It is great for Twenty year olds who are broke and want to get away or for people who just need a place to crash for a night or two. 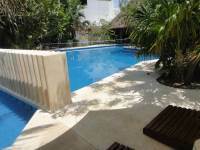 The best part about the Sotavento is the price as it is very reasonable for a hotel in the Zone for Cancun. The rooms were good sized and the beds were comfortable. 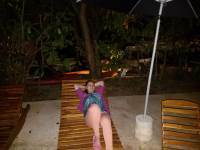 We really enjoyed the pool as we were only there for a day and just lounged about the pool and relaxed. The staff were very friendly and accommodating and were quick to help us with any questions that we had. Internet is only available in the lobby but it is free. The restaurant is decent and the prices are reasonable. The hotel is in the hotel zone but it is closer to the edge so if you are looking for the markets or nightlife, you will need to take a taxi. All in all it is a pretty good hotel but it is not a resort and does not have the features of one. This hotel is off the beaten path, and you cannot beat the price. There was a bit of mold in my room, no internet in the rooms, but the window AC worked well. Okay for a night or two, I wouldn't enjoy it much longer than that. Nice hotel. Nothing fancy. Good a/c. TV with 2 American channels. Hard beds. The people are very nice. Breakfast is just ok but the price is right, free. I would just stay away from booking any tours with the people in the lobby. I did and when I got to my destination they never booked it and I received no satisfaction from them after that so just a warning to stay away from that from an actual person that went though the fiasco. I just went on Trip Advisor after that. I had the best 10 days staying at this hotel! Very clean.. the food was great! The staff were wonderful! Just a 2 min. walk to get the bus and go down town or to other beaches. Very easy to get around! The people I met there have now become to be great friends. Good Things: My room was very clean. Good view to the lagoon. Good restaurant. Respectful and nice staff. Improve: never used the pool. They clean the pool frequently but the leaves in the pool diminish the amount of chlorine, so I don't like that. They should reduce the size of the trees to allow the sun rays to enter. Too much shadow in the pool for me. 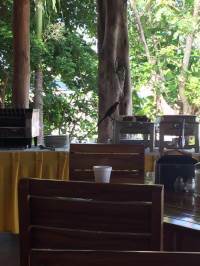 The birds in the restaurant, no like. 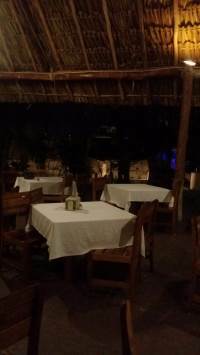 They need to clean better the tables and chairs.No Wi-Fi in the room, only in the lobby and restaurant area.I recommend this hotel if you go to Cancun to enjoy other things than the hotel. If the hotel is for sleep and eat select this hotel. 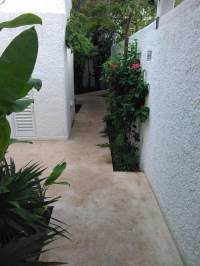 On a quiet street but close to beaches. Authentic Mexican style. food okay. Beautiful garden surrounding pool. Wouldn't change where I stayed. Clean and quiet. Short walk to buses and a good Mexican restaurant around the corner. The hotel surprised me in very positive way. The hotel is huge but very interestingly designed. 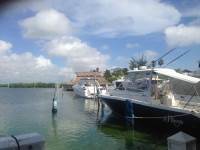 It is located next to one of the lagoon on the north of Cancun´s Zona hotelera. 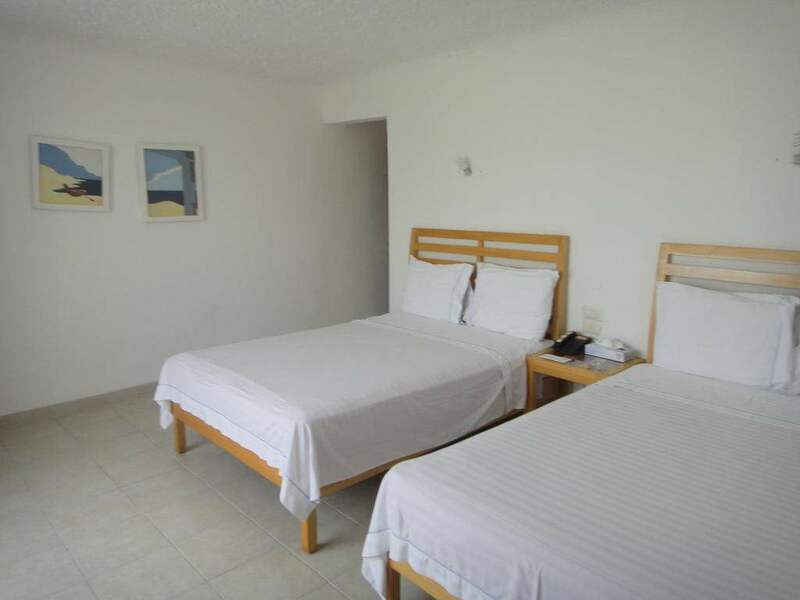 It is very easy to get anywhere in the famous Zona hotelera or in city Cancun from the hotel because many public buses drive there. 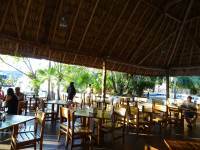 The hotel has a perfect restaurant and food is in very reasonable prices. Breakfast was tasty and good. The lady on reception was kind. 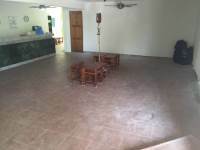 Room was very big, simply furniture but contain everything what you need for stay. 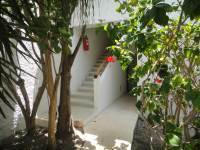 The separated blocks of rooms are situated in kind of "tree jungle". Cleanliness was also good. Good value for money and quality. Near the hotel is high tower with view on the city and very nice and long walking path. Highly recommend. Next time in Cancun I will come back to this hotel. 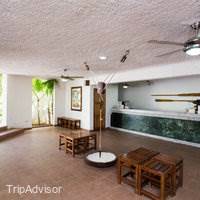 My friend and I booked for 14 nights, stayed for 21 nights. 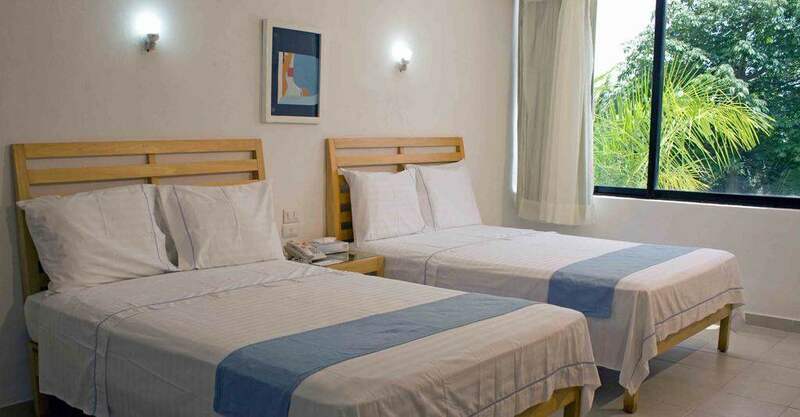 Not luxurious but very, very clean comfortable rooms with very comfortable beds and a good sized bathroom with efficient shower, the ground floor rooms each having a patio and little garden. 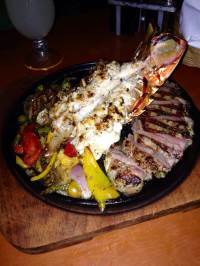 Good restaurant and bar serving basic but good Mexican food freshly cooked. Breakfast very basic but that's OK. Lovely gardens, a small pool, sun terrace and very peaceful setting on the lagoon with lovely views. 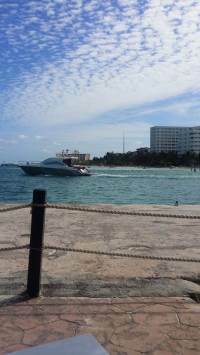 Great bus service a few yards away and the ferry port for Isla de Mujeres is just opposite. The staff are lovely, reception, housekeeping, bar and restaurant and the gardeners, all lovely, welcoming, friendly people who are only too pleased to help and assist. Would absolutely stay again. It was nice, not luxurious but nice. I stayed for 4 days during Spring Break. The place is clean, quiet and nice. Is not luxurious so don't expect things like that. They have hot water and Air Conditioner. 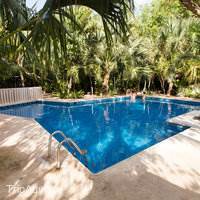 The pool is cleaned every morning but by the noon is dirty because is surrounded by trees. The breakfast I didn't like because they only offered eggs, bread, watermelon nd cereal, I was expecting a little more than that. You don't need to check in your guests and they don't put a wristband on you. The people are very nice and amicable. I recommend this place. 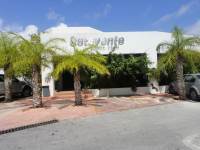 Also be advised that this place is pretty far from the Cancun famous strip with the main hotels and clubs. Buses do pass like every minute for only 10 mexican pesos or one US dollar. 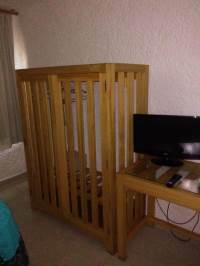 This was the most horrible hotel we have stayed in Cancun. Not what they advertise at all! Very dirty, rude staff, the food at the restaurant was horrible. Our room had a safe with the lock missing. First day there and we come back from an all day tour only to find our room wide open! We freaked out! When I spoke to the reception guy he said no one was in your room today, not even the maid! That was a big fat lie! Our beds were made, new towels on bed and the maid had taken the tip from the nightstand. They didn't even apologize. The reception guy started talking to me rudely and my husband had to step in and let him have it. 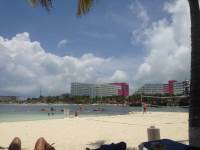 We packed our staff and booked at the Ramada Cancun. Then while waiting for a ride to the new hotel, their concierge started harassing us trying to get us to pay the hotel for a cab. The rooms were disgusting! 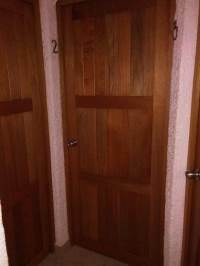 Full of black mold, the floors were dirty, the springs on the bed were broken, no internet as advertised and the staff plain rude and ignorant. SAVE YOUR MONEY, DON'T STAY THERE! Especially if you have children. Very shady place! My room smelled like pure mildew. I couldn't even sleep in the room, I had to stay in a friends extra bed. All my clothes were soaked the next day from the moisture. and smelled like mold spores. Fun. 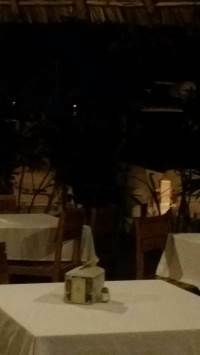 The restaurant staff wouldn't even wait on us after sitting there for 20 minutes. We had to go up to the counter. After waiting for an additional 20 minutes. They didn't even make my sandwich. I rated it a 2 because the people we travelled with had decent rooms. They barely smelled like mildew. It's sad because it could be such a beautiful property with a few improvements. The room was dirty the floor and the bathroom was full of hair! I cleaned it myself because of the rumors that the staff is stealing! Upon arrival anyway as we were going to stay for just three nights, we asked at the front desk for our rooms not to get cleaned up by their staff out of the fear of being robbed and of course we never left anything else than shoes and clothes in the rooms! Only bath towels provided and most of them dirty! No hair dryer in the room! If you ask at the front desk you might get one that works poorly! Break is just poor and tastes like garbage! Only think is decent to eat is some bread with butter and marmalade! Air conditioning & Wi-Fi in the room is a joke! 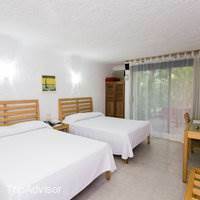 So far I was trying to feel content with my choice because the room was really cheap comparing to other cancun hotels plus it was in a good spot near the bus station with a really beautiful garden! What made me furious was that when my boyfriend got seek and I refer to the front desk to ask a thermometer the conversation went like this :-Hi do you have a thermometer for me to borrow? - No I don't. - Don't you have here a first - aid kit or something like this? - Oh yes, one minute- in front of me he opened "something like" a first - aid kit with just some plasters & a couple of bandages inside- and said : No I'm sorry. I guess I should feel like he said he was sorry! Thank God there is a pharmacy about a kilometer away from the hotel and I bought myself one! What kind of" three star " hotel does not have a proper first - aid kit? Just don't do it! Find yourself somewhere better to spend your money! It doesn't worth it! 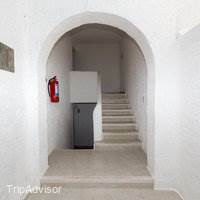 This evaluation is personally created from my point of view and my claims and must therefore be regarded as individual and not to be applicable to everyone.I think this hotel can not meet every need, I personally chose this hotel for the following reasons.1. 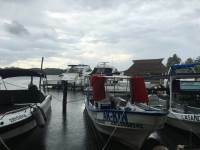 Location to my DiveCenter, I was diving all day and needed in the end only a place to sleep and shower.2. Price / performance ratioAbout the rooms:Simple equipment at beds and closet, safe available (plus), bathroom size and equipment good, air conditioning available but this musty odor by probably inadequate maintenance.The clothing stinks after a week disgustingly but I had this problem also in a 5 star hotel in Akumal for $ 2000 a week!This is, however, a fundamental problem of room design / ventilation and is Hotel dependent.The room service was good, 2 (minus points) were however:The constant forgetting of the cleaning staff, to depsoit a new bath mat in the bathroom, whereby after the shower the floor was always totally wet.The cleaning staff had forgotten several times to lock the room door, whereby each person was able to enter the room, in my opinion an absolute NO-GO.This of course has negatively affected the tip.I have discussed these points with the hotel management which promised immediate withdrawal measures.Service:As already described the staff is friendly, in the restaurant area unfortunately not very motivated, it lacks a bit of attention to the customer of which the profit as well as the customer, without waiting long for a beer, would benefit.The restaurant has good selection of local dishes and tasted very good, price / performance is reasonable.The green area is very nice, there is also a pool and even a diving center.The breakfast included in the rate is good and price / performance is reasonable.I would book this hotel at this price / performance ratio again at any time. From the moment I arrived, I felt welcomed. Also, I brought my service animal with me and the staff were so great with dealing with that. They welcomed her too. Every time I had a question they answered it and I feel like they really worked hard to make sure I had a nice stay. Also, I always felt safe and secure. I had friends staying at a nearby resort hotel who had something taken out of their room, I feel lucky to have stayed here, it was very relaxing. The only downsides that I need to mention is that my room smelled a little musty and wet and I wish that there was wifi in the rooms. Other than that, I would definitely stay here again. Another bonus is that the staff gave me a bunch of recommendations for restaurants and things to check out and each one was awesome! Great place to stay with family and affordable. Staffs are friendly. Public transportation close by. Walking distance to ferry to go to the island. Safe to walk around. Park close by for stroll. Convenience store next door. We enjoyed our stay. Sotavento is in the north of the Cancun hotel strip, it will take you about 20-25' to get to the more central part with shops and restaurants (which you can do on local buses for 50 cents, buses are frequent though sometimes crowded).Breakfast at the hotel is very basic: cereals, fried bean paste, bread with jam and butter, omelette, one type of fruit, coffee, tea, milk, one type of juice and that's all. If you spend more than a few days you may come to feel the lack of variety.The remote control and wifi didn't work in my first room. Not a big deal, but in my second room the remote control and air conditioning didn't work whilst wifi worked. Can't have them all, I guess. Wifi works very well in the reception and restaurant areas.The hotel has a small swimming pool but it's shaded by trees. You never get any sun irrespective of where you are and the water tends to be rather cold.There is a scuba shop on site, if you come to Cancun to dive it might work rather well as they depart from the hotel's own jetty.Positives: the building is adequate and clean, the restaurant for lunch and dinner has good and well-priced food, location on a jetty close to the exit to sea.Negatives: various niggles, breakfast, location far from the Cancun hotel strip centre. Terrific service, but only a 3 star hotel. 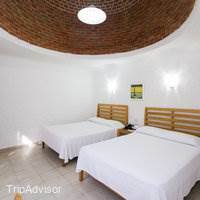 Sotavento is a clean, simple, hotel. 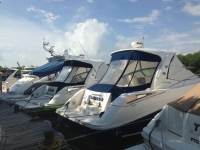 It's extremely convenient if you are going out on a boat from the docks located directly adjacent to the hotel. It seems like the crowd is a little older, which is good. Service is great, but some of the rooms located near the bar/restaurant can be NOISY. I stayed at this hotel for 5 nights as part of tour.My room (M5) was located immediately adjacent and above the restaurant. 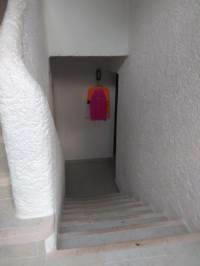 It was incredibly noisy both at night, until around 10 or 10:30 and again in the morning starting with breakfast at 6:30.Walls are thin, which can add to the noise level.The room was adequate with two double beds. 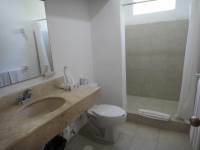 The shower pressure is amazing!Fresh linens and towels everyday, but only towels, no wash cloths.There is a flat screen television. One English speaking station, but is cartoons only.A.C. is fine.Staff are helpful.Rate is economical, not a lot of frills. Onsite restaurant is o.k. Prices are quite reasonable.Onsite scuba vendor, but I did not have time to take advantage. Unfortunately my experience here was very poor. I stayed for almost 2 weeks and was with a group of 8 people.. We all felt the same. The staff is inexperienced and lack basic problem solving common sense. The breakfast is of lower quality than what I had in places like backpacker hostels. The rooms not always cleaned properly and towels missing some days. The Wifi doesn't work in rooms and the pool is very basic with bare uncomfortable wooden loungers. At the restaurant the chairs are the same as the loungers.. no comfort. Service is 'help yourself' style and inconsistent for almost everything. The food takes forever to arrive even though the quality.. I hate to have to post negative comments but this is what I have experienced at Sotaventa. I stayed at this hotel for 5 nights while I was getting a dental implant at Cancun Dental Specialists. When I arrived at the hotel, the check-in went good. I ask for the name of the lady at the desk but I cannot find it now. I found the staff helpful and professional. They were willing to lock up my tablet when I ask. the front desk did a job of helping me feel comfortable and valued. The room was small and the safe was too small for my 10.1 tablet. The room was simple, clean, and beds comfortable. 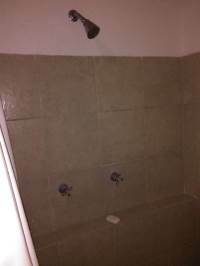 It had a big shower with old plumbing. The air conditioner worked good. Maid service was good. 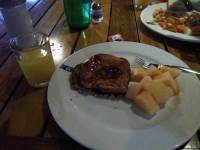 The restaurant was open air and the continental breakfast consisted of some fruit and each day had something different. 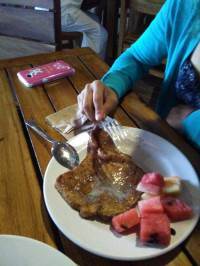 It had French toast one day, pancakes another and another scrambled eggs and ham. 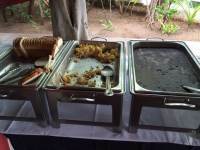 The eggs were decent and were not runny like you find on many of the bigger resorts buffets. I had 3 dinners and they were all good and one lunch. Everything I ate was good and inexpensive. The service was much better in the morning than in the evening. 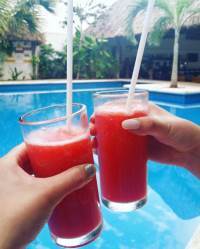 I have wanted to stay in a Mexican hotel and I did. I am really pleased with the stay and value of the hotel and food. The stay was pleasant and I have no complaints. I will probably stay at a nicer hotel next trip. I noticed that the average rating for this hotel is about 3.5 and if the choice was available was allowed it, I would rate at the level. We chose the hotel because it was really close to the Captain Hook departure, this was we wouldn't need to take a taxi or bus after the activity. The room was fresh, AC functional and breakfast pretty good. Negative things could be no wifi in the rooms (at least our) and they start music at 8am in the restaurant, not the best if you want to sleep a little longer. We liked it and I would recommend it anyways. 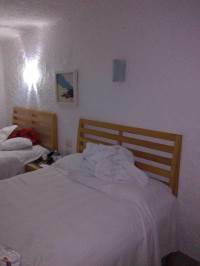 +Clean, big rooms.Comfy beds, we had two 140 cm ones in our room.Close to bus station and a small store just outside the lobby. 20 min walk to find a nice beach, there is one cross the street but then u have to lie on the beach in the scolding sun because the hotels own all the sunchairs. Dive-center at the hotel, by the pool if u want to try it. U can rent a safe for a deposit.-Bedding is a bit torn with small holes.The staff is a bit, "whatever". Seems like they need some positive injections. The sunchairs at the pool have no mattreses and are made of solid wood so they are really uncomfy. Breakfast is only toast, coffee and juice. Sometimes scrambled eggs, Sometimes something else. There is always something that is missing, cups, forks, coffee etc.Just two restaurants within 10-15 min walking distance. A really good tacoplace just down the street. And the Cocos & Grill further down. Otherwise just take a bus to the Plaza. CleanSecureHelpful staffQuiet corner10 mins from town.I never ate at the restaurant but it's very hard to find bad Mexican food.They did charge me some extra tax which I found quite dubious but they do that everywhere in Mx. And other reviews mentioned this so I was expecting it and didn't make a fuss.A good place if you are in a budget. And if you aren't, it's still not that bad. 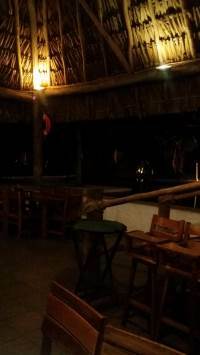 I could stay there again as a solo traveller even if I wasn't on a budget.No regrets! Nice bedroom but there is no mini fridge and mosquitoes are constant in the summer. I stayed in a bedroom with 2 confortable beds. 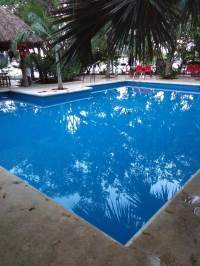 The pool is clean and the restaurant has good price. This hotel has a good localization next to Av. 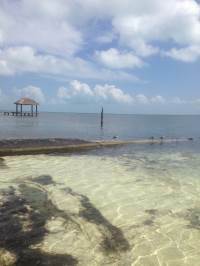 Kukulcan, Playas Las Perlas and Tortugas. 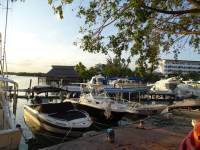 The location of Sotavento Hotel and Yacht Club is very convenient as it lies between the elite Hotel Zone and the trendy Downtown. 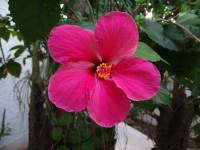 Even the staff of this property is very friendly and try to do their best. 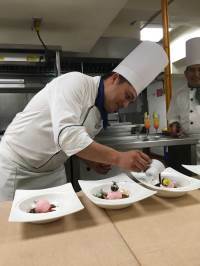 It may not be as exclusive as some of the All-Inclusive Resorts around the place, but it is value for money in true sense. I simply loved staying here. 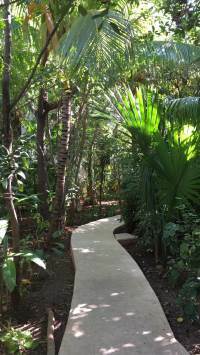 Good quality hotel in the thick of the Cancun atmosphere, yet away from the hectic main boulevard. 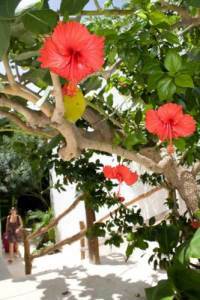 There are some lovely tropical gardens surrounding the pool and contains some lovely shaded areas. 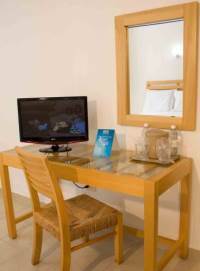 The staff are helpful and polite and the rooms are clean and adequate. Good value. If you like travelling affordably and getting an authentic local experience, this is a great place. 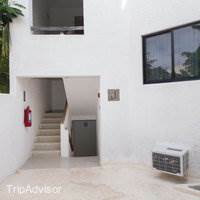 It's busy with a lot of locals and travelers looking for a quiet home base in the busyness of Cancun.Tricky review with great highlights and a couple of disclaimers. Rooms and beds are comfortable with strong AC (all or nothing in our room so bring some warmer pajamas - you'll need them by morning).The restaurant was my biggest highlight as there was a great variety of choices on the bilingual menu, and the prices were about 25% cheaper than other places we visited. Everything was good (we ate there 7 times for lunch/supper). The nachos con arrachera were the best I've ever had in my life. I came starving from diving and could barely move afterwards. 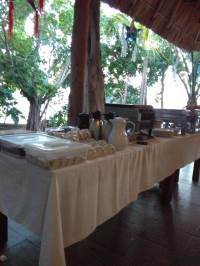 The continental breakfast varies throughout the week, and is included in your room cost. Not fancy but a solid start to the day. 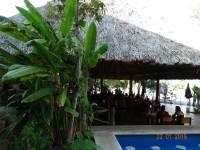 It's a beautiful vaulted thatched roof outdoor setting surrounded by tropical trees and on the water. Strong wifi in restaurant, wifi in rooms was sketchy at best. I never did get a signal.The marina is beautiful. Lots of cool fish that can been seen from the dock. 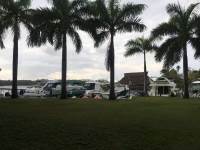 You should avoid swimming in the marina as boats and the local lagoon crocs are something to be avoided. 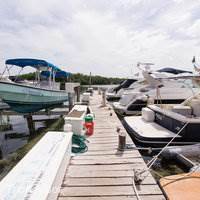 Local pickup for scuba diving is a huge draw for those who rather spend their money seeing the underwater world. 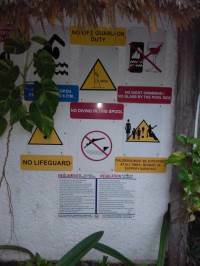 There is a dive centre on site.Managing 'resort' expectations is essential to having a great time. A dedicated staff works around the clock to keep the pool and pathways clean. It can be tricky to communicate if you don't have rudimentary Spanish skills, and some things take a while to get taken care of. It took 2 days to get a bath mat and our phone never was fixed. Construction that will make the lobby beautiful eventually made the siesta tricky.Mosquitoes are troublesome in and out of the room. We typically spent 5 minutes each evening on a hunt to make the night easier. I was fine but my friend got bit every night.Normally those final things would be a deal breaker back home, but for the location and price, it became part of the story and adventure. I hope to come back. I stayed in this hotel for a SCUBA diving trip. It has it own pier at the lagoon so any boat can pick you up. 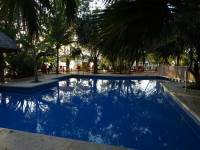 The price is really good... not the bes hotel in this wolrd, but it was worth. 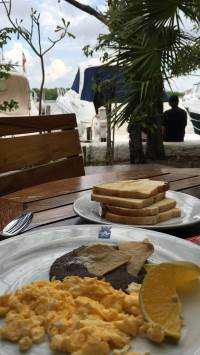 The breakfast is simple, but not bad.Is not really near from the beach, but if you are planning a SCUBA trip, it is a good option. Great hotel for the price. Kind of difficult to find at first. Hotel is tucked back off the main hotel zone road at about KM4.5. Desk staff is slow to warm up to, but when they do, they try to make things good for you. Never had a problem the 2 times I have been here. Workers spend all day keeping the rooms and the property clean. There is a event desk for arranging excursions. They have a pool. A scuba staff on site. A great restaurant with a bar with the best staff. Enjoyed my time with bar with staff members Alvero and Will. Had a lot of fun. No problem speaking English here. Few parking spaces. No problem parking on street. AC in room can only be used when you are in it, so when you come in from being out all day the room will be hot and humid, but cools down quick. Wi-Fi is hit or miss. But good place for the money. I will be here again soon. I wanted cheap clean safe on the water and the hotel is all those things. 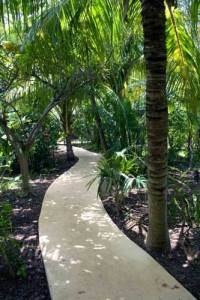 The rooms are like stucco villas hidden in a lush jungle. 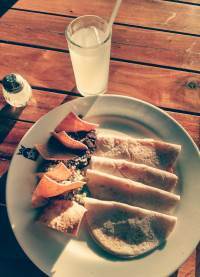 The Mexican food on the restaurant menu is awesome and very affordable. 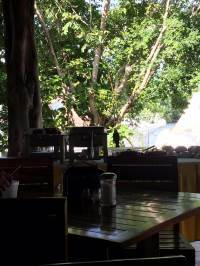 The restaurant sits on the lagoon and the breeze off the water in late afternoon is again, awesome. The club sandwich and chicken sandwich are recommended as well as the fajitas. That's all I ate. Very good. My room was spotless. The decor is plain but oh well. I had at least two English channels all the time but no internet in the room. iPhone worked great. AC is window unit and makes hearing TV difficult, however, around mid morning the breeze picks up and you can open the window. My room overlooked the gardens as most do and it's very private on second floor. I found the staff friendly helpful and most spoke more English than I spoke Spanish. So why a 3? 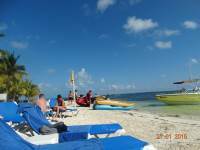 The price was reasonable but you have to cross a very busy street to get to the beach and I did not see an area designated for the hotel. Three are other hotels with no trespassing signs. The beds are super firm or downright hard. The continental breakfast needs modification. The scrambled eggs black beans and toast are good. The pancakes were awesome but they put a very sweet molasses syrup with pancakes instead of maple. The one toaster for 180 guests is a major traffic jam. The melons and orange juice were terrific. I had no car and the local buses looked crowded and dirty so I stayed near the hotel. Two local convenience stores were great for snacks. I stayed there for two nights, and my overall feeling when leaving was that it was okay. It wasn't amazing, but I didn't expect that either considering the price. It was clean and the staff was nice. I had no reception what so ever in my hotel room, not even Wi-Fi but after almost 3 months in Mexico I'm pretty used to that. There's a breakfast buffé that was okay as well, it had toast, some cereal and some hot foods. 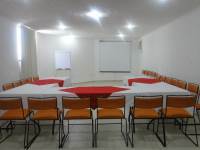 It's a great location, close to the bus which goes along the hotel boulevard and to downtown. 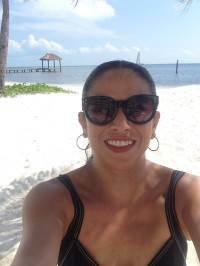 I would definitely stay there again if visiting Cancun. 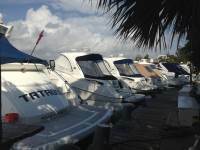 We booked four rooms for one night at the Sotavento Hotel & Yacht Club because of problems with our AirB&B booking. 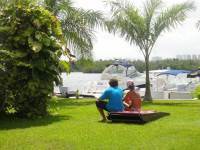 It is located in the Hotel zone but on the lagoon side. Parking was easy, the staff were pleasant and Wifi was good in the hotel lobby. Breakfast was OK. The big problem was the mosquitoes. Everyone was badly bitten even though we all were continually spraying with Off with 50% deet. The next day we moved to a hotel on the ocean side. I stayed 3 nights at this hotel and I'd stay again. It's a basic, no frills type of place but perfect for what I was looking for. 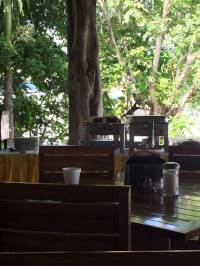 -It was QUIET, not a party atmosphere whatsoever.-Wifi in the lobby and restaurant.-Breakfast included in the price I paid was toast, cereal, juice, coffee, tea, and then sometimes fruit/sometimes eggs and beans. Just what I needed to start my day.-Two small bottles of water in your room every day.-Ice bucket in room to get ice from bar.-Flat screen tv with some english channels.-Restaurant/bar had good food at reasonable prices open daily til 1030pm.-Comfortable beds-You can rent the lock for the safe for $20 which you get back when you return the lock.-AC works VERY well.-I guess there is room service, I just never used it.-It seemed like a lot of the front of house staff speaks at least a little english. 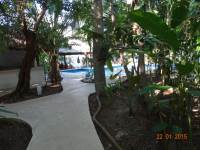 I certainly got by without a problem.-The pool area is nicely shaded and very relaxing. Lots of seating, though the loungers are wooden and not very comfortable.-There is always someone in the lobby to help you. Front desk people or tour people.-Convenience store next door.-Close to bus stop.-Right on the lagoon. My husband and I stayed here for two nights. Best thing I can say is that the ac was cold...very cold...too cold! The room felt like a cave. 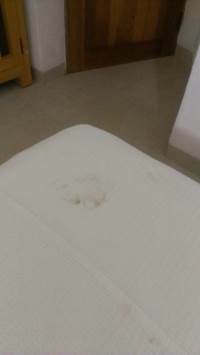 Stains on blankets. 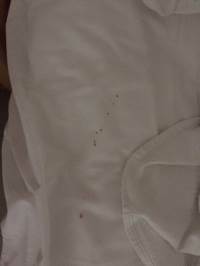 Holes in sheets. No one friendly at front desk. Couldn't wait to leave. 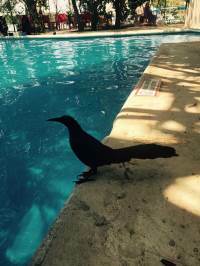 We arrived to this hotel after 15 days spent in Mexico and belize and this one was the worst. Probably it depends in which room you are. Our room was in basement and thanks to high humidity, there was stink and mold. Another thing is that there is no wifi. However the staff was very nice and friendly. We stayed here doing spring break week. It was quiet and relaxing. It is one block from a busy boulevard - but we heard no real street noise. 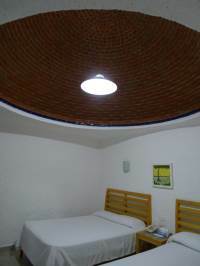 Rooms were large, the bed was comfortable, the air conditioning required the room key to function but worked well. The restaurant was surprisingly good and inexpensive. It was very easy to pick up the local buses running virtually every two minutes in each direction - to city center or to the hotel zone. The bus cost about 60 cents!!! We used them extensively, and we are a couple in our mid-60's who speak no Spanish. The room itself was okay/ though housekeeping seems to spend most their energies on grounds sweeping etc tile floor with a inch of dust underneath my beds.The staff speak no english with the exception of one person/ they all actually seemed a bit hostile instead of helpful, There was also plumbing issues in my room. The food they served for breakfast was just terrible even for free/ i soon realized they were using leftovers from dinner just on the verge or a bit past spoiled, There was no security at this hotel/ and since it is close to the main street there was alot of undesirables constantly hanging about, which created a bit of tension for me personally, There are many other three star hotels in the immediate area which are a much better value in my estimation It is also on the edge of the hotel zone not all the same as the hotel zone proper. For the above reasons I personally would elect to stay elsewhere Also no english speaking channels or internet. Stayed here for a week just to get away. 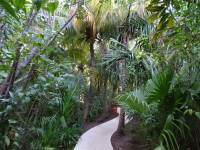 The landscaping makes it look like a jungle in the middle of the property. Nice restaurant with reasonable priced food. Beautiful setting tucked away on the island. One block away from main street with local bus system. Cheap and many buses are running all the time, never wait more than 5 minutes.Walk out the front of the hotel to main street and turn left, walk about 500ft to Carne de Michoucan restaurant. Great food at very cheap prices. Big portions. The rooms were clean and the water hot. The wifi was poor in the room but good in public area and restaurant. Staff was very helpful and courteous. We found this hotel sufficient for our budget.. 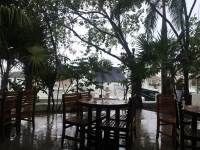 The gardens are very tropical and pretty with the restaurant situated right near the lagoon - very pretty (cheapskate food and drinks)The room was ok but did have a slight smell of mould. The beds were reasonably comfortable. 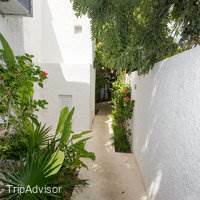 There is a small patio off the room that sits you amongst the garden, very peaceful and quiet...The bus into the hub of Cancun nightlife is very easy to catch at the end of the road. 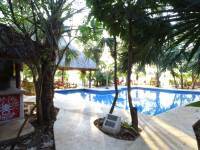 It costs about 10 peso each way..To sum up this hotel, I would stay here again! If your looking for flashy hotel, this is not for you. 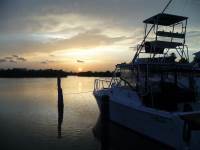 It's nice and reasonably priced..Watch out for mosquitos around sunset! Hotel has good access to the main Kukuclan Ave & bus/taxi route into busier areas with restaurants & shops. they start at approx km9 of the hotel zone. we walked it one day but quite a treck if it's hot. Only $1 for the bus & 200 pesos for a taxiThe dock for ferries etc was within 3-5min walk with a lovely bar called Serenas.. very friendly staff with lovely rattan sofas to be able to relax & watch the yachts go by.We also ate lunch here a couple of times which was reasonably priced & very tasty.also from here you could get access to the beach & walk to your left all the way up to the public beach where sun beds, showers & loos were complimentary.Our room was in section B of the hotel & very basic. whitewashed walls & very plain. Our bedding & towells were always clean if not a little worn looking but spotless & smelt fresh & aired. The hot water was intermittent (avoid showering at peak times)& the shower head needed a good descale, only a few jets worked shooting water out in all different directions. However you have to take some things with good humour as you do only get what you pay for......basically we slept pretty well, cleanliness wasn't an issue & it was in a fairly good location.The reception desk staff really need a good few lessons in communication & delivering customer service. Didn't see a smile all week, they had an attitude of indifference & unfortunately this really leaves a bad reflection on the hotel. We asked for 3 days for a lock for our room safe only to be told that there weren't enough available....be careful this appeared to us to be a bit of a scam. our patio doors only just barely locked although you could still see daylight through the gap, there was additional security in the shape of a broom stick which was cut to wedge in the runner of the patio door so that even if the latch was lifted the doors wouldn't slide. On the first day after breakfast we came back to our room & the broomstick had been lifted to an angle where it didn't wedge the gap, it would have slid upwards to allow entry. We carried all of our valuables with us ...jewelery,phones passports until the end of day 3 when we complained at how ridiculous it was that they didn't have a lock for every room safe! within an hour one was supplied to us....again indifferent attitude to guest security. The tour guide staff were more friendly & helpful...not that we had to bother anyone much we just got on with it & did our own thing.The other staff however were warm & friendly restaurant /bar/ housekeeping & especially the gardeners always had a smile & "buenas dias".Breakfast was basic but can honestly say always tasted fresh & was just alittle something to get the day started.everyone just really kept themselves to themselves we chatted briefly to another couple of guests but I think everyone did the same thing & just used it as a base. It was a little like a ghost town during the day. only saw scuba lessons in the pool no one else went in. the gardens & outside areas are tended to lovingly it's just a shame that the rest of the hotel doesn't get the same attention.nice dock to walk along & see the Yachts....couple of overlooking hotels now closed & dissused which is a shame.we did wonder if the hotel was having supplier issues during our stay because the bar became almost non existent. even local beer & spirits were very sparce.Some other guests were very inconsiderate & made an awful lot of noise when returning to their rooms anywhere between 3am-5am & would gather on the walkways outside the rooms to open close...open close...open close their doors chat/ scream/laugh all at the top of their voices & then proceed to put the TV on loudly. The reception staff could clearly hear them but didn't mention anything to them.I don't object to having fun myself but you do try to think of others too. we didn't bother to say anything they left after a cpl of nights & that sums up the reception staff as indifferent to the comfort of their guests.overall really just such a shame as this could be a really nice little hotel if someone came in with a different attitude & bit of organisation.if you are going to stay here it is good value ...however be smart don't leave anything to chance keep valuables with you or locked away & don't expect a friendly warm atmosphere where you would want to stay all day.